Safety Program - American Integrated Services, Inc.
At AIS, our focus on excellence includes a strong commitment to achieving an incident and injury-free workplace. Safety training begins upon hire and continues daily at every job site. Every crew member is educated, empowered and motivated to ensure his own safety and the safety of his team. 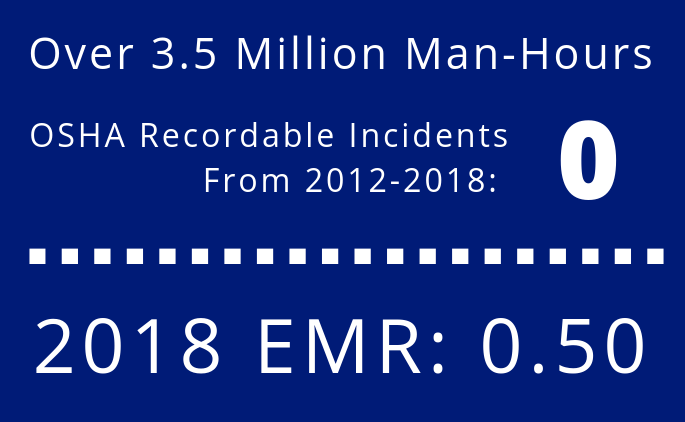 These efforts, combined with a top-down safety culture, have resulted in an EMR of 0.50 — well below industry standards. AIS’s work force is dedicated to the belief that all accidents are preventable and a zero-incidents goal is attainable. When it comes to achieving world-class health and safety performance, there's no room for compromise at AIS. It's not about statistics; it's about people not getting hurt. We are committed to having a health and safety record that makes us proud. Our vision and values statement calls on every employee and contractor working for the company to strive for incident-free operations, and to manage risks to prevent injuries, illnesses and accidents. Safety and health responsibilities come first, last and always. Our position on health and safety is clear, emphatic and fixed at American Integrated Services: it applies to everyone everywhere - whether walking down a hallway in an office or excavating hazardous wastes from a congested downtown environment. Zero incidents is no accident. Ensures that all employees and subcontractors understand that working safely is a condition of employment, and that they are each responsible for their own safety and the safety of those around them.